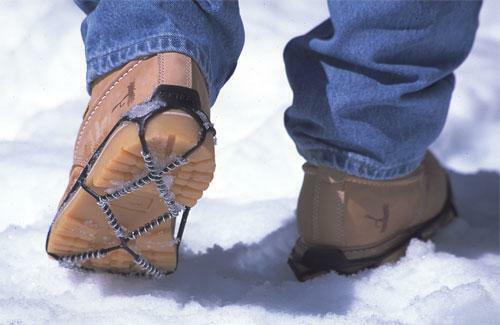 The simplest, most effective winter footwear traction device. When you walk or run with Yaktrax, every step you take places hundreds of bitting edges in direct contact with the ice beneath your feet. 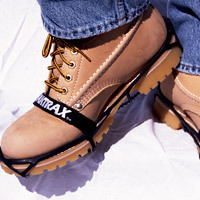 Yaktrax creates a solid, secure grip by way of the exclusive SkidLock coil system made of specially treated steel. As you step, each tiny SkidLock coil presses downward, becoming embedded into the ice below. 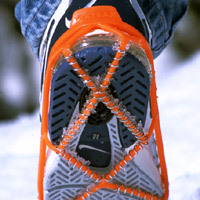 As you trasfer your weight onto your foot, hundreds of SkidLock surfaces squeeze into the ice, providing you with stability in all directions: forward, backward and side to side. When you lift your foot, the SkidLock coil system stays snugly with your footwear, offering unhindered ease of movement. You will move about naturally and securely. There is nothing new to learn. Just walk as you normally would and experience stability on ice and snow that you have never felt before.